This post is a travel guide with the best things to do in Palolem in Southern Goa. Goa is the most famous beach destination of India that everyone is raving about. Indians and foreigners alike talk about the beautiful palm fringed beaches and the relaxed hippy atmosphere that makes this a backpackers heaven. On my fifth trip to India I decided that now i should go. How could I have been to India so many times without visiting Goa? Why visit Palolem in Goa? Because everybody was always talking about Goa I thought it was a single place. I was wrong. Goa is a whole state with a variety of things to do. North Goa is famous for its parties and South Goa for its relaxed atmosphere. Then there are the cities of Panaji and Vasco de Gama to see the old Portuguese colonial architecture. Add jungle, waterfalls and spice farms and I knew I had to make some though choices with the limited time I had. I am an explorer, so my ideal beach destination is a place where there is enough to do besides sunbathing. After some research I decided on Palolem in South Goa. According to the Lonely Planet one of the most postcard-perfect beaches with its curve of palm fringed sand. More important for me was that there were enough things to do in Palolem besides the famous Palolem beach or Patnem beach. Is Palolem in Goa India’s best beach destination? Now was Goa really the best beach destination in India? Maybe my expectations were set too high by all the Bollywood movies filmed there and all the newly married couples that make Goa their honeymoon destination. In my honest opinion it is overhyped and there are other places with equal appeal such as Varkala in Kerala or Gokarna in Karnataka. That said, Palolem is a great place to relax for a few days. The beach is beautiful, no doubt. The seafood is amazing and there are enough things to do in Palolem for a wonderful holiday that is not just sunbathing on Palolem beach or Patnem beach. Jungles, wildlife parks and spice farms are waiting inlands for you to explore. So let’s continue this post with the best places to visit in Palolem. Kerala’s backwaters are famous and little did I know that Goa has its own maze of canals. 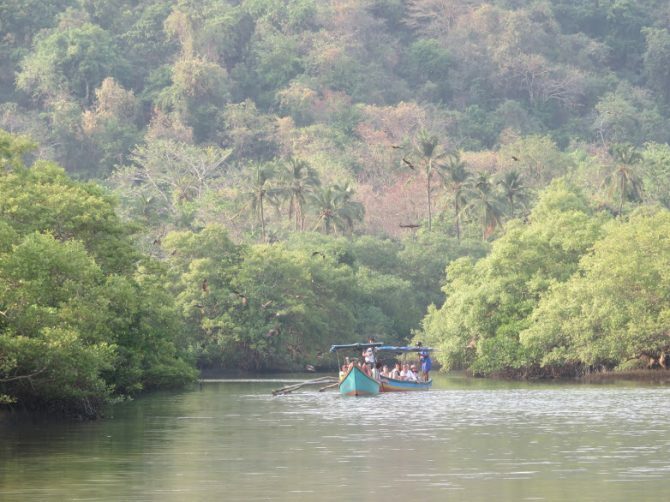 Behind Palolem beach is also a small network of waterways and canals heading inland. The backwaters are some of the best things to do in Palolem for nature lovers. Palolem’ s backwaters are the perfect spot forbirdwatching, especially in the evening right before sunset. We saw plenty of birds, including several species of kingfisher. Logistics: North of the beach there are boats that will guide you for a one hour tour through the area (300-400 rupees). Cotigao Wildlife sanctuary was one of my favourite things to do in Palolem. It’s Goa’s second largest sanctuary and home to deers, wild boars and leopards, although you would be extremely lucky to see them. We did see some wild boar that wanted to come and drink from the small water hole. They changed their minds when they saw us and ran back into the forest. Logistics: Cotigao is 9 kilometers south-east from Palolem. It is not so easy to reach the sanctuary by bus and it is better to negotiate a taxi to the sanctuary with waiting time. There are some interesting hiking trails and if you are serious about getting there early you can sleep in the forest department cottages behind the reception. Palolem beach and Patnem beach are not the only beaches you can visit in Palolem. There are more isolated beaches around where you’ll meet few other Tourists. Honeymoon beach is only accesible by boat. In the early morning plenty of boats are waiting for tourists to go to honeymoon beach and watch dolphins on the way. Logistics: Early morning there are several boat men near the main entrance to the beach. They charge around 1200-1500 rupees per boat. We found another couple that wanted to go and shared the costs. Expect the trip to be around 1 – 2 hours. Butterfly beach is another secluded beach where you can get away from the crowds at Palolem beach. It either requires a short trip by boat or a challenging hike through the forest. Again, dolphin sightings are very common near the shores of butterfly beach. As the name suggests, different species of butterflies are also present. We were lucky that our accommodation was in between Palolem and Patnem beach. The latter was my favourite, because it was way more quiet. Every morning we went there to swim and sometimes we were the only people around. We didn’t make it to see one of the spicefarms, but we talked to others who thought it was one of the best things to do in Palolem. You will come across spice farm advertisements throughout town and many tuk tuk drivers know some spicefarms they can bring you too. Depending on the recommendations of tuk tuk drivers can be a hit or miss and you are likely to pay more for his commision so it is good to do your own research. There is for example the Tanshikar spice farm that has good reviews. I heard that Sahakari farms is to be avoided because they offer elephant rides as you can read in the experience from Jessie on a journey. Are you falling in love with the Goan and Indian cuisine and wondering how to make it at home? It is possible to refine your culinary skills with one of the cooking classess that will teach you how to make your favourite Goan recipies. Try Rahul’s cooking classes or Masala kitchen. There are plenty of places in Palolem that offer yoga and meditation classess. From drop in sessions in the morning to retreats and proffesional courses to become a yoga teacher yourself. Earth yoga village at Palolem beach has good reviews and is a good place to stay if you are into yoga and meditation whether you are a beginner or professional. They offer a range of activities and I am sure they have something that fits your needs. Palolem is a great place to explore Southern Goa. Beyond Palolem is much more beauty to be seen. The portal cities of Margao and Vasco de Gama are at the heart of South Goa and make for a great trip. Explore the old Portuguese colonial architecture and buy souvenirs at the local market. Beyond the cities nature is waiting for you in Southern Goa. For example, you can see the Dudh Sagar waterfalls. One of the tallest in India. For more nature the Netravalli wildlife sanctuary is also a great place to visit. Of course Goa is all about the beach and if the different beaches in Palolem are not enough for you consider a visit to Agonda beach north of Palolem or Galgibagh beach south of Palolem. One thing I really liked about Goa and what is lacking in some of India’s other beach destinations, is the food. There are plenty of restaurants to choose from with amazing seafood and their own unique Goan cuisine. The Goan fish curry that appears on almost every menu is a must try. Besides a basic hut on the road side with no name that had the best fried fish, one of our favourites was Art resort Goa. It was right on the beach with an amazing view. Their mixed sea food platter was delicious. Along the beach there are hundreds of beach huts opening up during the high season (October – February). They vary a lot in price and quality so it is good to check some of the reviews on Trip advisor or booking.com. Unfortunately it is also necessary to book things beforehand during the high season, especially in December and January when prices soar alongside the number of tourists. Once low season starts around March things quiet down again and you are probably fine with just turning up and negotiating a good deal. We stayed in the Secret garden resort. Not at the beach, but in walking distance from both Palolem and the more quiet Patnem beach. Very friendly owners and professionally run. I had a good time there and was happy with my stay. They serve delicious breakfasts. Try the Kashmiri Kawa. It’s some kind of tea with an interesting mix of spices. I loved it. As mentioned before, there is a high season running from October till February. This time indeed offers the best weather with pleasant temperatures and less rain. However, it is also crowded, especially during the christmas holidays when prices go up as well. March till September gets uncomfortably hot and humid, but you might have Patnem beach all to yourself. Palolem beach will always see visitors and therefore has enough facilities to entertain you, even in the off season. The nearest train station from Palolem beach is Canacona which is on the Konkan railway. Not all major trains stop at Canacona so sometimes it is better to use the train station in Madgao, Panaji or Karwar. From Madgao & Panaji there are frequent buses to Canacona that take about 2 hours. From Mumbai there is the convenient daily Mumbai Mangaluru express night train (number 12133) that leaves Mumbai at 22:04 and arrives in Karwar (27 km from Canacona) at 09:58 the next day. From Karwar you can take a bus to Canacona. For Hampi the train times are not that convenient and often fully booked. However, there are several night buses (8 – 10 hours) that offer a bumpy but ok experience. They can be booked online if you have an Indian sim at Redbus, Yatra or Travelyaari. Bus tickets are between 700 – 900 rupees depending on whether you take a reclining seat or a sleeper. In high season it is better to make a reservation a few days before. If Hampi is your next destination you can read my post on the best of Hampi in 3 days. To Gokarna there are frequent buses (2 hours) and one train at 14:36 (number 56641) leaving from Canacona.